Based on the original Deportation Cross that was dedicatd in 1929 near the Grand-Pré National Historic Site in Nova Scotia, Canada. The Acadian Memorial is the first of several international sites to erect a replica of the Grand-Pré Deportation Cross. The original Deportation Cross, near the Grand-Pré National Historic Site in Nova Scotia, marks the site of embarkation of over 2,000 Acadian farmers and tradesmen and their families in 1755. A series of commemorative cross monuments will be designed and unveiled in Atlantic Canada, the United States, France, England, the Caribbean and Quebec to mark those sites where Acadians landed after the Deportation. Acadians settled many places on the bayous and prairies of Louisiana, but no point of arrival is more evocative of the whole tragic story than St. Martinville, poetic site of reunion and renewed hope. That is why St. Martinville was chosen by the Acadian Odyssey International Commemorative Project as the site of one of 37 replicas--the only one in Louisiana--to be erected on the many shores from the Caribbean to Europe touched by the Grand Dérangement. On June 15, 2003 the Acadian Memorial held the dedication of the Cross replica in St. Martinville with dignitaries from Louisiana, the United States, Canada, and France. Bishop Michael Jarrell of the Diocese of Lafayette led the blessing with Father Austin Léger, pastor of St. Martin de Tours Catholic Church. Governor of Louisiana Kathleen Babineaux Blanco, then Lieutenant Governor, addressed the more than 600 guests in attendance. Our Deportation Cross replica weighs over 800 pounds and was fabricated to exact standards from the original cross that was dedicated in 1929. 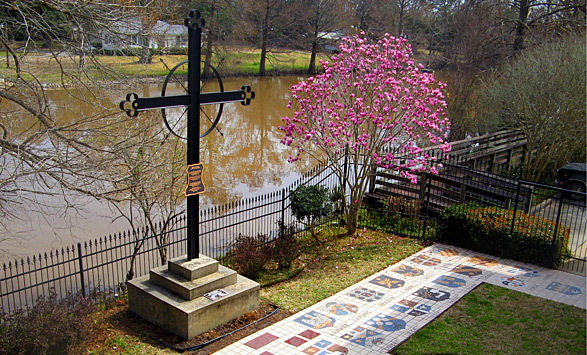 The Deportation Cross in the Acadian Memorial Meditation Garden, along with the Eternal Flame and the Coat of Arms Mosaics, located behind the Memorial building on the Bayou Teche. Our 18" necklace with pewter Acadian Cross makes a great gift and is a strong symbol of Acadian pride. Get yours now!